Learn what to do with those awesomely sweet rutabagas! Arlo wanted to make sure we talk about his favorite crop early in the blog, since he's working so hard this winter to rout the rabbits out of next year's carrot field. Carrots are by far the favorite vegetable of all species at Hartwood Farm, to the point where we have to supervise the dog to make sure he doesn't harvest them on his own! Unfortunately, carrots can be one of the more challenging crops to grow (as you may have learned if you grow them at home)! They are picky in what soil and weather conditions they thrive in. It takes ages for the seed to germinate (2 to 3 weeks) so the weeds can easily get ahead of them. And, in years like the last three, pounding May and June rains can compact the soil surface to further inhibit seed germination (or wash those tiny seeds away). We plan for our carrot planting a year in advance to make sure we have good weed control and till in lots of cover crops to improve the soil tilth so we have fewer issues with compaction. 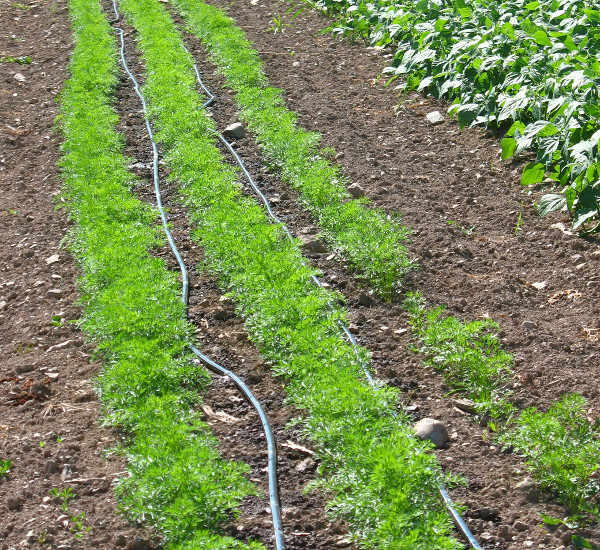 We use small overhead sprinklers to keep the soil surface moist while the carrots germinate, and make sure to weed at least once before the carrots are even out of the ground (since those sprinklers also speed up weed seed germination)! 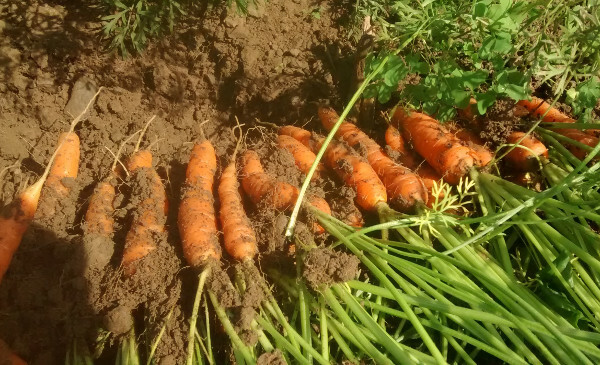 We plant one third to one half acre of carrots on the farm each year in a range of varieties, and have a big trial of new varieties going on in 2016. Spring and summer carrots tend to be mild and sweet, with a nice juicy crunch. Fall carrots are crunchy and sweet, and get increasingly candy-like as the weather cools off. Winter storage carrots are extra-carroty in flavor and (fingers crossed) last into April. Carrots are related to parsnips, celery, celeriac, dill, cilantro, and fennel. Prior to the 1700's they came in a wide range of colors, but the orange one became the most popular in the last few hundred years (it's the prettiest!). However, many purple, red, yellow, and white varieties are coming back into fashion and seed catalogs in recent years--we have purple and yellow on the docket for shares this summer. We like the uber fresh and local bunched carrots the best, which are available generally from early July through November. From December to April, we enjoy the winter storage carrots, and in May and June, we survive the carrot drought by using frozen carrots (we like to make carrot curry and carrot soup and freeze them in big batches). One sad carrot story before we talk about preparing carrots is that the cute "baby" bagged carrots are not really babies, but just ground down adult carrots (think rock tumbler for carrots). Look for real baby carrots at markets in June! Refrigerate in the crisper in a plastic or veggie bag, loosely closed. Carrots last months in proper storage, but you will want to check them every week or so and make sure they have adequately high humidity. If they get exposed to air they can desiccate pretty fast in a fridge. In a real root cellar, they are often stored in barrels in damp sand. You can also freeze carrots (chop them up and blanch for a few minutes first) for use later in stews and with roasts. Remove tops before storing! Carrots, like most root vegetables, tend to keep sending their moisture up to their tops for as long as the tops are attached. To keep carrots crunchy exponentially longer, we chop those tops off before we put them into the fridge. Can you eat the tops? is the most common carrot question we hear. It does seem a shame to compost or discard all that beautiful foliage, and some folks do enjoy eating carrot tops. We personally aren’t fans, but hear they are good in a mixed salad or saute, or as a garnish for carrot root soup. We are always happy to remove the tops for you at market--our pigs and our compost piles are happy to have them! We recommend that you scrub the roots with a veggie brush, but we usually don’t peel our carrots except some of the larger winter ones (in winter our chickens enjoy eating the peelings!). Sometimes a trace of bitterness develops in storage (if the roots are exposed to ethylene-producing things like apples), which you can mitigate by peeling the carrots. Raw—we usually scrub them well with a veggie brush, chop to the preferred size, and enjoy alone or dipped in hummus. You can also grate them into salads or mix with other grated vegetables (like a carrot and cabbage slaw, which is one of our favorite winter salads). Sauteed—this is our quick carrot go-to preparation! Carrots are delicious sauteed or stir fried with pretty much anything. I like to finely slice an onion and cook it for a few minutes before adding the chopped up carrot. I stir frequently, adding liquid if they start to stick, and the onions and carrots caramelize together into a delicious side dish. Baked—this preparation takes a little longer, but is my favorite way. We slice the carrots lengthwise into spears, toss them in a little oil, salt, and pepper, and then bake until tender at 375. In the summer, we combine them with green beans, and the winter, spears of potato (so they are almost like healthy french fries?). Steamed or blanched—lightly cooking carrots brings out even more of their sweetness and flavor, but make sure you don’t cook them too long (10 minutes tops, but we prefer more like 4 or 5 minutes) because over-cooking can destroy some of their nutrients and flavor. Steamed carrots are super-fast, and we just top them with a pat of butter and some salt and pepper. In anything... Carrots are one of the most versitile vegetables, which combined with their great flavor is likely why they are such a favorite. They are good in stews, soups, curries, roasts, and the crockpot. We add them as a bonus to almost everything we make. In particular, they are a great side in dishes like meat roasts—they cook in the same pan and do a nice job of absorbing pan juices, as well as a filler that makes almost any recipe healthier and heartier! They also are great on the grill! Kale: Love it or Loathe it? Kale is one of our favorite vegetables, and is definitely worth trying to cook or to grow for yourself!